To think it’s only been a year since the last set of bans – and it’s definitely a justifiable one in Archeops’s case, now that we’ve seen Pokemon-GX take the world by storm! Archeops is an even older card than Ghetsis, going as far back as Noble Victories – that came out nearly 7 years ago! Its Rock Slide attack is, big surprise, not the main reason he got banned. Turns out 3-for-60 and 10 damage to 2 of your opponent’s Benched Pokemon isn’t exactly what one would think is “ban-worthy”. No, the banning ability lies in the…well, Ability, Ancient Power, which prevents players from playing Pokemon from their hand to evolve Pokemon. Back when it was initially released, evolution decks were still relatively viable, though they had to compete with the Reshiram/Zekrom Outrage decks at the time, and those were just easier to use overall; you only need to play one card, it came out with a lot of HP, and what’s better is that it had an attack that could crush your opponents if they weren’t careful. So against the deck, Archeops could do nothing. It didn’t help that Next Destinies followed up from that, introducing the Pokemon-EX that would dominate the game for a long period of time, and soon enough Archeops eventually disappeared without ever being competitively viable…at least, not in Standard. Eventually, Pokemon-EX would gain their own version of Evolutions, M Pokemon-EX – simulating the Mega Evolutions from the game – and Archeops had a moment of fringe play against the strategy. It’s a pretty good deal to stop your opponent from evolving into their ace monster while simultaneously pushing for cards that didn’t need to evolve; after all, there were plenty of Big Basics to utilize with Archeops. But the card that really cemented Archeops as a viable option was Maxie’s Ace-in-the-Hole, a card which could bring Archeops into play for virtually no cost, outside of having it in your discard pile. Now you could prevent your opponent from evolving whenever you wanted – meaning you could evolve your Pokemon first, use Maxie’s on an Archeops in the discard pile (whether sent there by Battle Compressor or a Sycaper), and effectively grind out the game with your bigger badder Pokemon while your opponent was left in the dust. Needless to say, Archeops did not like the Mega-EX being around, but what really cemented its ban was the Pokemon-GX. Though around the time it got banned they were still relatively new, having only been first released a few months prior to the ban, the fact was that most of the Pokemon-GX coming out at the time were Evolution dependent. And while Archeops wouldn’t hinder decks like the Eeveelution-GX that could evolve straight from the deck or any deck running a Wally, it would hinder the majority of Evolution decks that didn’t have those options, and seeing as the game has continued to add in more and more powerful evolving Pokemon-GX, it makes sense to have Archeops hit the ban list for the sake of the format. After all, you can’t have Pokemon-GX trying to compete against the older Pokemon-EX when they can’t even get on the board. Arora Notealus: Coincidentally, Archeops hit the ban list at the same time as another card, Forest of Giant Plants. That card did the exact opposite of Archeops, enabling Evolutions in Grass decks that would allow them to play far more quickly than other decks. In fact, the card was so powerful that it ended up leading to the ban of the only other Pokemon card to hit the ban list, Shiftry, who has since come off the ban list as a result of Forest of Broken Plants getting banned. I also used to have the Shiny Secret Rare version of this card, which even to this day is a pretty good pull from any Noble Victories pack you get! Weekend Thought: What are your favorite cards from the Ban List? Did you like our flavorful themes for each day of the week? Maniac Monday? Trump Tuesday? I mean Throwback Thursday was still the same, but still! Which cards will you miss, and which ones are you glad are gone for good in Expanded? Would you want to play Expanded now that these cards are banned from it? What’s your favorite format to play? Archeops from BW Noble Victories didn’t see as much play at first due to dealing with the awkward fossil mechanic that was introduced in that same set. Regardless of what kind of fossil it is, having to look at the bottom 7 cards just to find the appropriate Pokémon is extremely unreliable unless you find a way to rearrange cards from your deck. With Archen being very hard to put down on the Bench and the format revolving mostly Basic-EX Pokémon, Archeops is hopeless in the Modified format when it was legal. Fast forward Febuary 2015, Maxie’s Hidden Ball Trick was released on XY Primal Clash, and the Expanded format was just barely started on September 2014. This Supporter brings a Fighting Pokemon from the discard into your Bench and draws 5 cards……..only if Maxie is the only card in your hand. Despite being a little tricky to perform, no longer you needed this unreliable fossil item card and Archen, you can simply put Archeops from the discard into the Bench. Why is this a big deal? That’s because you can potentially prevent the opponent from doing something before they even get a turn. Most notably, the ability to evolve your Pokemon from your hand is disabled by Archeops’s Ability. It was deemed unhealthy that it was banned September 2017, the same time Forest of Giant Plants got banned. Again, like yesterday’s card, it’s another card that locks down some of your opponent’s options. Fossil Friday closes out our first ever Ban Week. This card was banned a year ago alongside the much abused FoGP, and rightly so. By using Maxie’s Hidden Ball Trick, a player going first could fairly consistently get Archeops onto the bench before his or her opponent even had a chance to get evolution Pokemon into play. There were ways around it, but – consistent with Hex Maniac and Ghetsis – the designers viewed it as again being too much of an early game advantage, and Archeops became extinct from the Pokemon Trading Card Game. Generally speaking, I have no problem with the creators of the game banning cards. Honestly, they’ve done a really great job of restraining themselves when it comes to banning. They certainly could have banned quite a few more cards, and I wouldn’t be surprised to see the number of banned cards continue at this rate in the future. And I think that’s a healthy thing. We’re all human, we all make mistakes. When you see that you’ve made a mistake, and you have the power to correct that mistake, it’s a no brainer to fix your error. There’s no shame in that. It is a good thing to be able to admit you were wrong, and a better thing to take steps to amend the misjudgment. Hope you enjoyed our Ban Week! I’m really glad our team was agile enough to quickly adjust basically last Friday and put this all together. Kudos to everyone for being able to adapt on the fly like that. Welcome to Fossil Friday of our week of Whine & Cheese… or a Ban List week if you don’t care for my sense of humor. We’ll be re-reviewing Archeops (BW – Noble Victories 67/101; BW – Dark Explorers 110/108), which might come as a surprise. The new ban list added four cards – Ghetsis, Hex Maniac, Puzzle of Time, and Wally – so why not cover them all and just do one re-review instead of two? Why not Forest of Giant Plants? We just reviewed Puzzle of Time 15 days ago, and it hasn’t quite been a year since we last reviewed Forest of Giant Plants (which was the card’s third review), but Archeops was only reviewed the one time, not quite six and a half years ago! So Archeops just felt like it needed the re-review more. So, what is Archeops? A Stage 1 [F] Pokémon with 130 HP, [G] Weakness, no Resistance, Retreat Cost [CC], the Ability “Ancient Power”, and the attack “Rock Slide”. Rock Slide costs [FFC], does 60 damage to your opponent’s Active and 10 to two of his or her Benched Pokémon of your choice, which is bad and irrelevant because this card was all about its Ability. Ancient Power is what made this card, but not quite a while after its original release; Ancient Power prevents both players from Evolving their respective in-play Pokémon from hand. Effects that Evolve a Pokémon from a different location (like the deck) still work. When Archeops first released, it has a lot going against it. To begin with, though it is a Stage 1, the Pokémon from which it Evolves (Archen) is not a Basic, but a “Restored Pokémon”. ALL the “Fossil Pokémon” mechanics really need to be dropped, but I’m not getting my wish as they’ve just gone back to something closer to the original with the most recent examples. I will say that the Restored Pokémon mechanic is probably the coolest in theory but the worst in execution. To put any of the Archen we currently have available into play, you’ve got to use another card effect. 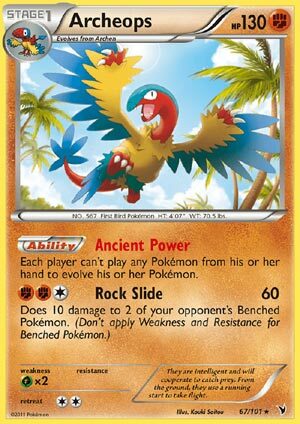 Ignoring what works for what was intended, we’re supposed to be Benching Archen from our decks with the card Plume Fossil, a Trainer-Item that reveals the bottom seven cards of your deck and Benches an Archen you find there (if any). Even with Archen (BW – Plasma Blast 53/101), which has an Ability that allows you to move it from your discard pile to the bottom of your deck, using the “default” mechanic just isn’t a great way to get Archeops to the field. Being so difficult to reliably hit the field by a player’s second turn, combined with Basic-only or Basic-focused decks meant it just wasn’t worth running Archeops to mess with the few that were Evolution-reliant. Fast-forward to the release of XY – Primal Clash about three-and-a-half years later. We received a Supporter called Maxie’s Hidden Ball Trick; while it has to be the last card in your hand in order to play it, it allows you to select a [F] Pokémon from your discard pile and put it directly into play on your Bench, then you draw five cards. Besides being the last card in your hand, you also need a legal target to Bench from the discard pile and an open spot on your Bench. That may sound like a steep requirement, but it turned out it wasn’t with the available card pool in the Standard Format of the time, and it remains quite reasonable in the Expanded Format now. Simply put, you should be able to build a deck that can reliably pull this trick off T1, even now. Which brings us to how Archeops was banned. Decks started using Maxie’s Hidden Ball Trick, usually just one or two, to create a swiss-army-knife play with one to three [F] Pokémon. Eventually, with Evolution decks being far more effective and popular than they had been for the first several years or Archeops’ existence, Archeops became one of the [F] Pokémon regularly used alongside a Maxie’s Hidden Ball Trick or two. Which meant decks could spare two to five slots, possibly with a slightly tweaked deck build, to be able to shut down any Evolution deck before it even got started, so long as the player using the combo went first. Even if that player went second, however, you could disrupt further Evolution. Not facing an Evolution deck? If you allowed yourself more than two slots, one could go to an alternate, useful [F] Type, like Gallade (XY – BREAKthrough 84/162). Actually, Archeops was often alternate and Gallade the main reason a deck would run Maxie’s Hidden Ball Trick. This is why Archeops was banned and unlike the other cards this week, this is the one I think might not have deserved the ban. Like Forest of Giant Plants or Wally, I think Maxie’s Hidden Ball Trick and its [W] Type counterpart, Archie’s Ace in the Hole, are just waiting to break something else. With Maxie’s Hidden Ball Trick and Wally gone, I’m trying to think if there is any way Archeops can hit the field before T3, let alone reliably. As a reminder, I don’t automatically score cards as “perfect” even if they were good enough to be banned.